Properly training your dog does more than just teach it good manners; it can sometimes be the difference between life and death. For instance, if your dog frequently escapes the yard to chase after other animals, cars, or people, an injury or worse is inevitable. Unless you plan on confining your dog inside, placing a fence around your property might seem like the logical thing to do. However, this can get costly, and a fence can sometimes negatively affect the appeal of your property. Also, it can block the view that you’ve come to enjoy. A solution to the problem can be an electric fence. Colorado residents who buy this wireless pet fence can enjoy peace of mind knowing that their furry pal is safe, even when it’s playing and having fun in the yard. Although you can purchase an over-the-counter wireless dog fence, when it comes to the safety of your dog, you want to make sure to use the best possible fencing. 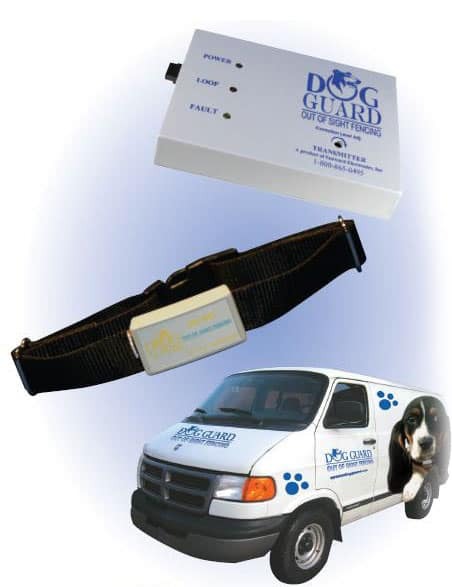 When it comes to Dog Guard’s underground fence, CO dog owners will be happy to know that it’s veterinarian-approved. By using state-of-the-art electronics, we set ourselves apart from any competitors. Your dog’s safety is our number one priority and has been since our establishment in 1988. We have equipment that can set boundaries indoors and out. The electronic pulses that occur when your dog crosses the boundary are safe and mild, yet effective. Whether you have a large hunting dog who enjoys running or a tiny dog who hardly weighs 10 pounds, we have appropriate receivers available. The receivers come in the form of collars and are part of the hidden fence system. Feel free to browse our website and read more about our transmitters and receivers. After purchasing our out-of-sight fence, CO residents should know that it will be installed by placing a wire underground around the perimeter of your yard or around another off-limits area, such as a flowerbed or a swimming pool. People passing by won’t be able to see that you have a dog fence installed because the wire is completely out of sight. For the fence to work, your pet companion must wear one of our collars with a receiver in it. When your dog goes within 3 to 6 feet of the boundary, a digital radio signal is activated and sets off either a noise that’s inaudible to humans or a mild electric pulse. The unpleasant occurrence is supposed to make your dog turn around and stay within the permitted area. However, if your dog is stubborn and decides to walk closer to the off-limits area, a second unpleasant occurrence will catch the dog by surprise and make it think twice. You can watch videos on our website for more information about the pet fence. Colorado dog owners won’t have to worry when their pet companion is outside in the yard. The process doesn’t stop after installing a hidden fence. CO dog owners must train their dogs to teach them that there are negative consequences if they cross a certain boundary. After our fully-trained technicians install the system, they’ll outline the off-limits area with small flags. You must keep these flags in the ground for up to two weeks. During this time, you must work with your dog daily to teach it that a certain area is off-limits. Learn to use positive reinforcement during training. When your dog goes near the flags, firmly tell it “no” and redirect it to an appropriate area. Once there, reward your dog lavishly so it’s most likely to repeat the desired behavior. With consistent reinforcement, your pet companion will learn to stay away from the area near the flags. After two weeks, you can remove the flags, and when training is done right, your dog will most likely not go near the boundary of your yard. If its curiosity does bring it near the off-limits area, the wireless dog fence will quickly kick in and remind the dog of what it was taught. In addition to being affordable, an electric dog fence is effective. Rather than dealing with do-it-yourself kits and figuring out how to get your dog to behave, have our professional install the fence and show you how to use it. Installing a wireless dog fence typically takes five hours on average but can give you years of peace of mind, knowing that your pet companion is protected and safe.